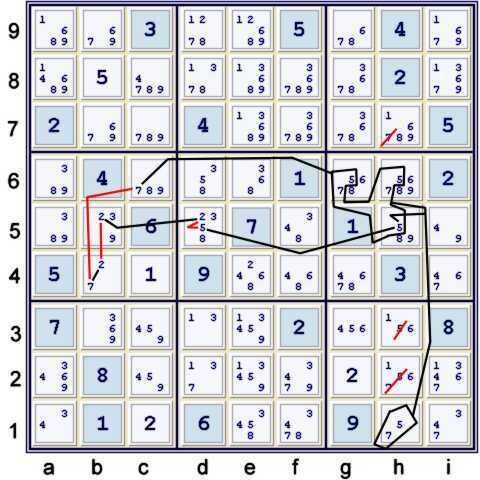 The following very sparselyillustrated solution for the potentially instructive Tough Sudoku of August 8, 2009 is intended only to further explore the concept of atypical groupings as Quantum sets. 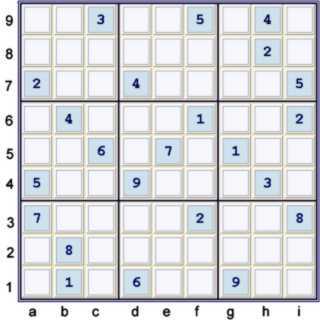 This particular advanced Sudoku solving strategy, tip or trick can be relatively simple to employ and to visualize. For those whom do wish to view a full solution path, I have posted at the bottom of this page a group of steps sufficient to slay this puzzle. The step above is significant in one additional manner: As an AIC, it is immediately clear that one achieves both eliminations listed. A proof by contradiction approach would often fail to get both these eliminations. Illustrated (poorly, perhaps) below is an example of thinking in groups. This is primarily, to me at least, what Quantums entail. One could equivalently view the deduction below as an Almost Y Wing Style loop. Also, one could describe it as using an Almost Hub Spoke and Rim pattern. Awareness of these alternative viewpoints may be helpful. However, one can distill the logic contained in all of these more simply. Candidate (5) in box h5 is limited to Column h and cell g6. I include the .g6 because (5-7)g6 is crucial to the deduction. It should be fairly easy to see that at least one of (57) at h56 is true, or (7) exists at c6. Thus, some sort of (NP57) exists at h156 OR (7)c6, or perhaps both. This does not quite finish the deduction. 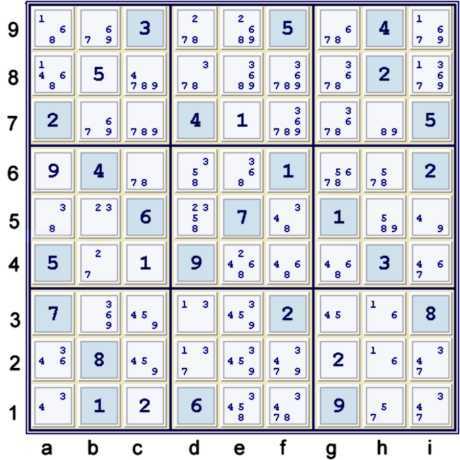 The chain works equally well considering candidate (7) in box h5 instead of candidate (7) in row 6. Such an alternative presentation is common. Here is the alternative presenation, also reversed in order, although this order reversal is arbitrary. Of course, the same eliminations are proved. This simple deduction happily serves to significantly simplify the rest of the puzzle solution. One can alternatively view this as a Kraken type step, considering all the possible locations for candidate (7) in row 6. This viewpoint is almost identical in logic. However, In My Opinion, it tends to miss the point of the simplicity involved in thinking in atypical types of groups. Almost Unique Rectangles (AURs) create similar types of atypical groups. The next step that I have chosen to discuss can be achieved by using either one, or both, of two AUR's. SIS created by AURs, two examples from one position, both leading to the same conclusion. Ultimately, to avoid either of these AUR's, we will end up avoiding both. This is a nice curiosity. Interestingly enough, if (6) does not occur at a2, then both Unique Rectangles would be, in a sense, inevitable. Naturally, since the puzzle has one solution, both Unique Rectangles will lead to some contradiction somewhere.